You'll love the elegant simplicity of these Very Berry Nachos. Cinnamon Sugar tortillas are topped with sweet berries and chocolate syrup. So delicious! Brush each side of the flour tortillas with melted butter. Spring each side with cinnamon sugar. Cut each tortillas into 8 triangles and line them on a foil lined baking sheet. Bake for 8 minutes, turning tortilla chips halfway through baking. While chips are cooling, cut strawberries and blackberries and add to a bowl. Sprinkle with sugar or Truvia if desired. Pile tortilla chips on a large dish. Top with berry mixture. 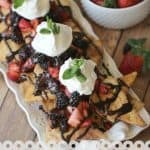 Drizzle Dessert Nachos with chocolate syrup and top with whipped cream.